Hailing from the Jersey Shore, Austin is a graduate of Belmont University with a degree in Commercial Music, emphasizing music business operations. Coming from a musical family, with grandparents playing everything from polka to gypsy jazz, music is in his blood. 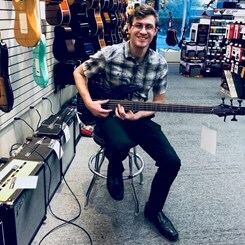 He greatly values learning of all forms; and when he's not viewing historical music documentaries and studying the ins and outs of musical pieces, he can be found developing his own rhythmically based Bass compositions. Outside of musical interests, Austin loves being outside in nature, especially near the ocean.